The Lee Auto-Disk Riser allows use of other brands of dies that have extended adjusting screws and provides clearance for the Lee Safety Prime. Adjustable Charge bar infinitely adjustable between .28 and 1.6 cc. Lifetime nylon with solid brass, zero backlash micrometer. Easy to set. Double Disk Kit (not pictured) This raises the hopper so you can stack two disks. This not only doubles the capacity of the disks but it makes very fine adjustments possible. Most powders can be adjusted up or down .1 grain with different combinations of disks. Complete listing of combinations, 4 extra disks, screws and risers are included. 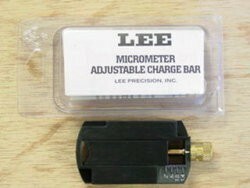 Update any Lee Auto-Disk Powder Measure with all the PRO features, except for the teflon coating. Includes oversize hopper and valve assembly with elastomer wiper, swivel adapter assembly for fast and easy transfer between die sets, pullback lever, chain and attachments, solid brass knurled thumb nuts. With FREE adjustable Charge Bar. Pullback lever for progressive reloading. Eliminates the possibility of powder binding while reducing the chance of missed or double charges caused by operator error. For fast and easy transfer between die sets. Screws into your die without rotating the measure. Allows precise positioning with firm clamping. Fifteen uniformly graduated and proportioned powder dippers. Slide card shows the grains of powder each measure will dispense of every type of powder. Powder measures are inherently safe as they cannot get out of adjustment. That's why powder dippers continue to be the first choice of reloaders who load in small quantities. A large, unbreakable funnel that fits all cases from .22 to .45 caliber. Hole in flange permits mounting to the Lee Turret Press, shelf or bench.